The Dòlianòva Cathedral dedicated to Saint Pantaleon, in Italian San Pantalèo, is one of the most important Pisan-Romanesque style churches in Sardinia with some Gothic elements. Its construction took place in three phases between 1100 and 1289 and it was built of sandstone. The area of the former cathedral of Saint Pantaleon has numerous archaeological remains ranging from the protohistoric to the early Christian period. In the church site, there are a baptismal font dating to the 5th-6th century and a pillar dated from the second half of the 10th century, showing the attendance of the Christian well before the construction of the church. 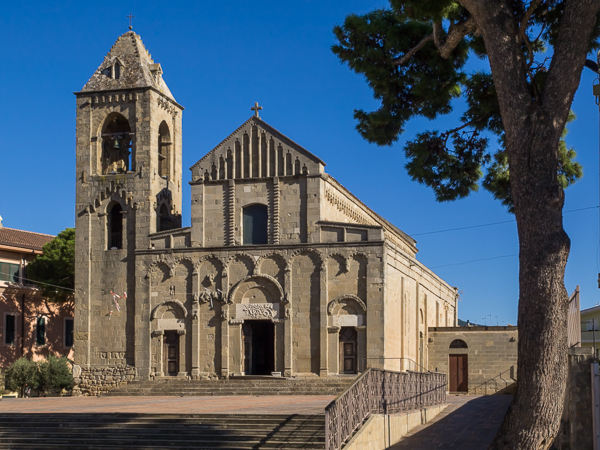 The studies conducted on the monument showed the presence of an old church of the Early Middle Ages, that was a Cathedral when the diocese was established in Dòlia in 1089. In 1503 the Diocese of Dòlia (the ancient name of Dòlianòva) was suppressed and merged into the Archdiocese of Càgliari. It is now a co-Cathedral. The church has a facade horizontally divided into two parts. At the bottom there are three portals with architrave and arch. On the architrave of the central portal, there is a sculpture depicting a coiled snake among reeds, according to Saint Pantaleon’s legend, and it was assumed that this lintel is much older than the church. The front top has a central window and ends with a wall of triangular shape decorated with arches resting on slender columns. A square bell tower stands on the left, horizontally divided into two parts. The bell tower has a pyramid-shaped stone roof covering. On the left side of the church, at about 4 ft (1,30 m) far from the side entrance, there is a funerary monument dating to the end of 1200, which consists of an ancient sarcophagus mounted on Roman columns and surmounted by an arch supported by slender octagonal pillars. Internally the church is divided into three parts, with a nave and two aisles, divided by partition walls and cruciform pilasters, some of them of the Gothic polycolumn type. The interior covering is made entirely of wood. On the right side, at about two meters far from the main entrance, there is a baptismal font surrounded by four columns: two of them are based on lions. On the right on the font, there are sculpted capitals that portay New Testament scenes, such as The Nativity and The Adoration of the Magi. Behind the altar it is painted the date 1289, year of the consecration of the cathedral. Along the right wall, between the first pillar and the side entrance, there is a wooden crucifix dating between the 15th and the 16th century . At about 22 ft (7 m) far from the crucifix, there is is a 14th century fresco inserted in a red painted frame, with three concentric circles inside. The central circle depicts the crucified Christ, while in the other two circles there are saints and prophets. From the cross, some branches come out with spheres containing phrases of religious piety. On the right side of the frame, St. Francis is depicted while giving a blessing with his right hand. The medieval Saint Pantaleon’s retable, dating to the end of 15th century, is located on the left side of the fresco, and it is composed by six paintings on wood, horizontally split in two rows of three parts. At the center, Saint Pantaleon is depicted as a doctor performing miracles, while at the top the Madonna of the Book is depicted with the Infant Jesus, angels and a bishop kneeling down before her. In the four side panels around there are shown some scenes of martyrdom, which occurred in the year 305 during the persecution of Diocletian. The fresco of the apse is heavily damaged and it is preserved only in part. It dates back to 1261-1289 and represents a scene of the Last Judgement with Christ enthroned in the center within a “mandorla”, that is a vesica piscis shaped aureola of light around him, surrounded by two angels and two other unknown saints, perhaps identified with the Virgin Mary and St. John the Baptist, with apostles, angels and two small trees (probably the Tree of Knowledge of Good and Evil and the Tree of Life). The church is situated at about 600 m (1968 ft) from the Dolianova city centre. When arrived, go through Corso Repubblica in north direction, until the crossing with Via Vescovado. Then enter Via Vescovado and after 50 m (164 ft) the church is on the left, with a big car park just in front of it and a footbridge on the right.